College athletics • USU filed for state trademark of chant, but SDSU has filed with feds. Trent Nelson | The Salt Lake Tribune Utah State fans try to distract Colorado State Rams forward J.J. Avila (31) as Utah State University hosts Colorado State, NCAA basketball, Wednesday January 15, 2014 in Logan. This is an archived article that was published on sltrib.com in 2014, and information in the article may be outdated. It is provided only for personal research purposes and may not be reprinted. 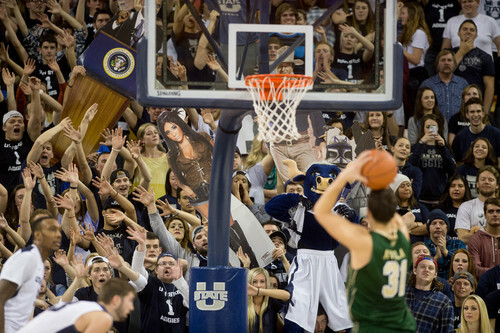 The popular Utah State basketball chant "I believe that we will win," might be moving from the Spectrum&apos;s court to another during this offseason. USU school officials are mulling what steps to take after learning last week San Diego State filed for usage of the "I believe" slogan with the U.S. Patent and Trademark Office in October 2011 for its clothing shop, Aztec Shops Ltd. The rights would include usage of the slogan on any caps, hats, jackets, bottoms, shirts, T-shirts, sweatshirts and other clothing articles that use the words. SDSU&apos;s filing, which came to light in a recent USA Today article about sports trademarks, is scheduled to be published for opposition July 22, which means Utah State will have 30 days from that date to file a notice of opposition. Utah State officials are determining what action they should take. Tim Vitale, the school&apos;s director of public relations and marketing, is confident a satisfactory resolution will be reached. "I believe that we will win," he said. "It&apos;s a core part to our being and fans who come to our basketball games know it and love it." While it might seem a tad ridiculous to trademark something as ambiguous as a feel-good chant for an athletic team, it is serious business. So much so that Utah State trademarked versions of the slogan in 2012, such as "I Believe," "We Believe," and "Believe It," and trademarked the whole slogan on Feb. 21 of this year. However, here is the catch  Utah State&apos;s filing is for a state, not federal trademark. Vitale and Heidi Adams, the school&apos;s trademark and licensing director, said Utah State intentionally went with a state trademark because it knew other schools use "Aggies," as a logo and didn&apos;t want to create issues for them. "We didn&apos;t need the entire country, just the closest geographic base," Vitale said. Apparently, SDSU believes otherwise and is going for a trademark agreement that would give it national control. Greg Block, the school&apos;s chief communications officer, said SDSU specifically sought a federal trademark because it has an alumni base "from all over the country." "It has been the general policy of Aztec Shops, when registering trademarks, to register federal trademarks for the purpose of protecting our ability to continue to use those marks in interstate commerce," he said. Adams and Vitale hope a resolution can be reached that would satisfy both schools, but Vitale said the school is prepared to move forward if a legal battle arises. "Right now we are looking at our options," he said. "We are aware the deadline is coming and we will choose to respond in time for it." Even though the Aggies started using the chant in 2006, credit to its origination goes to Navy in the 1990s. San Diego State started using the chant in 2010-11, but its usage has grown on a national scale  as witnessed by the many fans who used it to rally in the World Cup. Vitale hopes other institutions such as Navy will join in opposition if San Diego State pursues a federal trademark. "This is something that goes right to our being," he said. "Our fans and students know it and live it, that is why we trademarked it." Adams said the school has filed more than 100 trademark rights, the majority of which were filed with the state. Most of those are in reference to the schools&apos; use of the "Aggies," name and logos. However, Adams believes more and more trademark issues are going to arise thanks to the growing national impact schools are enjoying through multi-media exposure. "In the future more chants and slogans are going to be trademarked," she said. "Schools see them as the spirit of the place and there is a need to protect those so other establishments don&apos;t."